From Gubbio to Assisi, through the National Park of Monte Cucco, Colfiorio plateau and the Park of Mount Subasio. Majestic landscapes, ancient abbeys, hermitages, lost in the silence of inaccessible places. 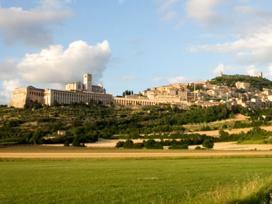 Here, we come across two art cities, Gubbio and Spello, and finally rest in Assisi. Elegance and Mysticism. Gubbio looks like a huge Nativity scene, with its city walls clutched to the rock of Mount Ingino, where the Middle Ages meet the elegance of Reinassance and Baroque. The maze of Gubbio’s alleys resembles a travel backwards in history: Palazzo del Capitolo dei Canonici, Palazzo del Bargello, the Cathedral, Palazzo Ducale, up to the lovely Piazza Grande, which offers one of the widest and most charming landscapes in the whole Umbria. The ermitages of Monte Cucco. Heading North from Gubbio, we cross the Appennini towards Scheggia and Pascelupo (SS 298 towards via Giove Pennino, frazione Villamagna, frazione Sant’Angelo dopo Serra, località Fornace). The regional Park of Colfiorito. Our trip continues towards South (SS3 towards Fossato di Vico, Gualdo Tadino, Nocera Umbra), leading us to the Regional Park of Colfiorito: a 850 acres plateau, 250 of which taken up by a marshland, abounding in wildlife. Spello: art, religion and gastronomy. Now we go down for 4 miles towards Spello (via Subasio), which stands on the top of a hill, at the feet of Mount Subasio. In the well-preserved Medieval walls, four gates and a Roman arch are still the only accesses to the center. The main monument is the Church of Santa Maria Maggiore, with the extraordinary Cappella Baglioni, frescoed by Pinturicchio. The most typical event in Spello is the “infiorata”, taking place during the feast of Corpus Christi, when streets are embellished by pictures, entirely composed by flowers laid upon the pavement.